For my first visit that week, my friend and I ordered Jumbo Plate A (Php 190), which has Beef Gyudon, Chicken Teriyaki and mixed vegetables on top of plain rice. 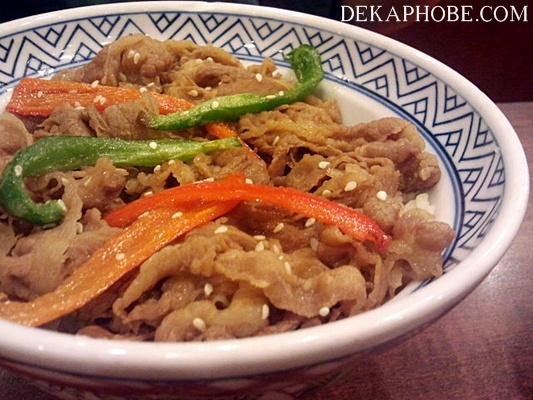 The beef gyudon looks a little bland but doesn't taste bland. I love the sweetness of the chicken tempura, though. Jumbo plates are supposed to be good for two..if you want a light meal. But if you're really hungry, you can finish the jumbo plate by yourself. For my second visit, my friend and I got newest dishes: Tokyo Chicken Bowl (Php 149) and Tokyo Beef Bowl (Php 139). 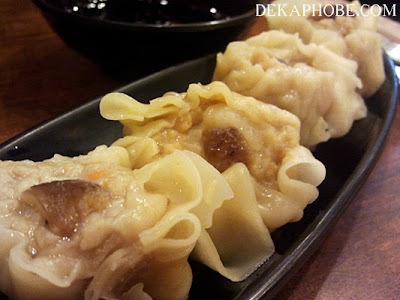 We also shared Shitake Shu Mai (Php 59). Shitake Shu Mai is Japanese pork dimsum with shitake mushroom. It was soggy, maybe stayed a little bit longer in the steamer, and it was kinda spicy. The Tokyo Beef Bowl has beef with sesame seeds, onions, bell pepper strips on top of rice, while Tokyo Chicken Bowl has crispy chicken fillet and mixed vegetables on top of rice. I think my friend loved the Tokyo Beef Bowl since he finished the whole thing while I was still halfway through my bowl. :) The Tokyo Chicken Bowl is so flavorful, and I loved the crunchiness of the chicken skin. hindi kami madalas dyan.. but now that you've mentioned it, we'll try next time! konti kasi branches e.
I personally don't like eating at Yoshinaya.. :( I don't know.. Maybe I'm just quite picky with my Jap food. Here comes the addiction Michy! Lols...hahaha! If only I'm around there I can be a food tour buddy and together we'll explore the foodies of the metropolis, more specifically you're new level of love for the Samurai people's food. I love what I am seeing in the photos. 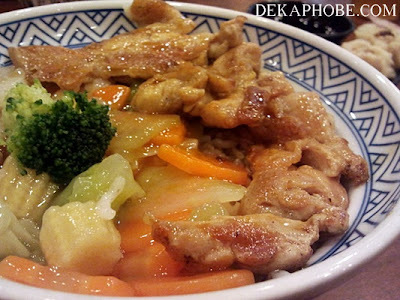 I can't remember when was the last time I've eaten in Yoshinoya but one thing is for sure I so loved their servings.